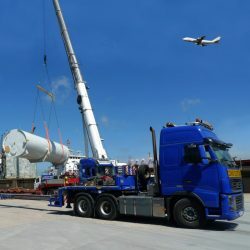 Specialist Logistics Services provides expert global abnormal load handling and general freight forwarding services. The movement of abnormal loads and heavy equipment is the backbone of our business. Our staff collectively have over 85 years’ experience in the industry and can offer bespoke, economic solutions to all abnormal load movements. Attention to detail is a prerequisite to our ability to advise clients on the correct procedures to be followed in relation to each project. Satisfied customers are the key to our business and we treat each project with the utmost importance. We regard every load as unique and our significant knowledge ensures each client’s requirements are not only met but also exceeded. Specialist Logistics Services are registered members of the FTA and BIFA, and provide services under their terms of operation. Please click the logos below if you would like to read more about these terms. For more information about SLS you can download our brochure here. You can also download our company Terms and Conditions here.